Maybe you spent your new founded cash doing all of the laundry you procrastinated completing until now. Maybe you used it responsibly printing all your resumes and CVs for interviews. But there is the off chance you might have not touched your Crimson Cash at all since getting that $25 last Saturday and then, oh wait…$50 more today. Don’t know where to spend it? Still unsure what can you get for your money? Let us guide you in making smarter, more productive decisions in spending what you have. Tanjore: There are a bunch of restaurants nearby the Dunkin Donuts on JFK. One of these hidden places that appears right next to the IHOP (yes, we also have an IHOP near the Square, get with it) is Tanjore, which serves regional Indian cuisine. Enjoy the 9.95 lunch buffet available 7 days a week. You might only be able to get food at the place declared “Best of Boston 2003” for a week at most, but it’s worth it to explore a whole new side of the Square. 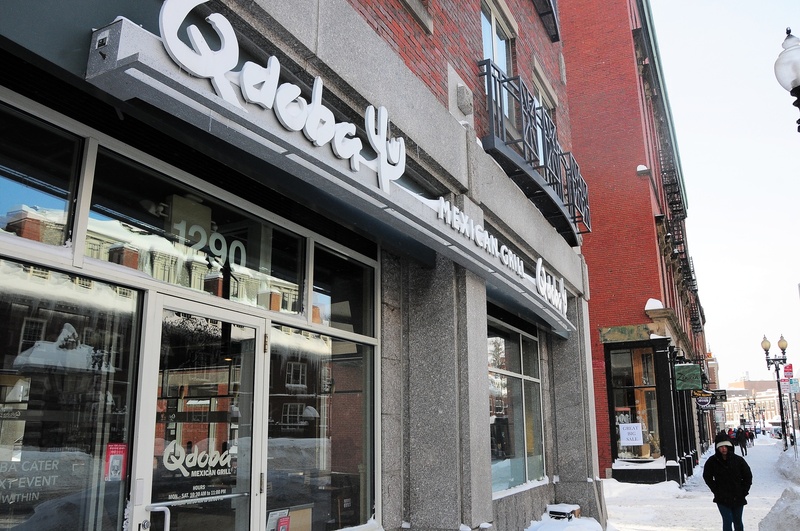 Qdoba/Boloco: For when you remember that Chipotle or Felipe’s don’t currently take Crimson Cash, but you still want to stuff your face with Massachusetts's best attempts at Mexican food. At Boloco, a big bowl costs 8.99 while a mini burrito cost 4.49 and you have a chance to travel the world with your taste buds with flavors like “cajun,” tikka masala“ or “bangkok thai.” Qdoba always offer the game changer of free toppings. Either way, you may get more bang for your Crimson bucks. Liquiteria: If the Crimson Cash machine starts working again, why not enjoy this smoothie place and the bragging rights that you’re eating healthy. Indulge in the $8.50 “coffee-n-cacao” for a little pep in your step. Or maybe the 6.50 “hangover cure” tomorrow morning. Henrietta’s Table: Located in the Charles Hotel, Henrietta’s Table might not be a first pick for you. But maybe you like the finer things in life and one to indulge in one good dish. Not a meal of course, but a dish. Entrees for ‘supper’ start at 17 dollars. Maybe it would be more fulfilling to just buy multiple starters starting at 7.00. If you want to go all out, why not use the full $50 you got today for all you can eat brunch on Sunday? It’s not a Veritas waffle, but it should do you over. CVS: Oh yes, CVS. With two locations in the square, it wouldn’t be too hard to buy greek yogurt or multiple VOSS waters. You can get anything you put your mind to. Why not get Halloween started early and buy all the candy you will swear you will share with your friends? You may also delight yourself in multiple pints of ice cream after a midterm, an interview, or just life in general. Because of the 24/7 access, don’t be surprised if you use your extra Crimson Cash to find yourself at 3 am buying an item you most likely don’t need that much. Sami’s Wrap n Roll: It’s great if you’re an undergrad who constantly goes to the medical school to work on some cure to a dangerous disease or research for your thesis. Otherwise, you don’t need to go there.